This tutorial shows how to build a SAMSON Element on Windows using Microsoft Visual Studio (MS VS). If you have not installed the SAMSON SDK, please, follow the instructions from the Installation of SDK section. Once CMake is installed, generating a project for your development environment is straightforward. 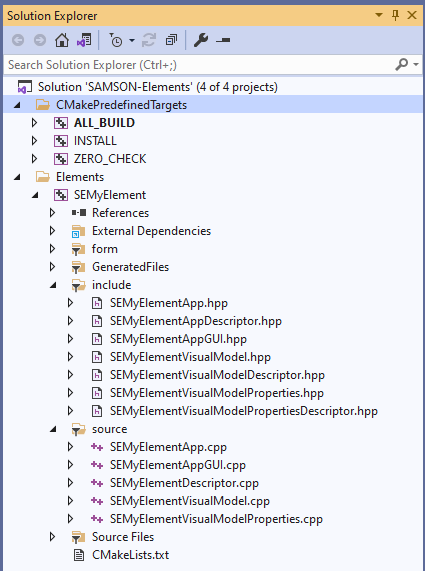 In this tutorial, we will show how to configure a project for a SAMSON Element in Microsoft Visual Studio (MS VS) 2015+ using CMake for generation of VS project and solution from the command line. Microsoft Visual Studio 2017 has introduced a built-in support for handling CMake projects - you can create a CMake project with taking into account the information provided below. Let's assume that Qt is installed in YourQtPath (i.e. the folder which contains the Qt5.9.3 folder) and the SAMSON SDK is installed in YourSDKPath/SDK/0.7.0/ (i.e. the folder which contains the following sub-folders: cmake, include, libs, SAMSON-Debug). Go to the folder where your SAMSON Element is stored. Open a command window from within the build folder ( Shift + right click on the build folder and choose Open PowerShell window here in the context menu), if there is no build folder, create it. cmake -DSAMSON_SDK_PATH="YourQtPath/SDK/0.7.0/" -G"Visual Studio 14 Win64" ..
cmake -DSAMSON_SDK_PATH="YourQtPath/SDK/0.7.0/" -G"Visual Studio 15 Win64" .. The -G designates the cmake generator, to check the available ones execute cmake -h in the terminal. You can add files to (or remove files from) your new SAMSON Element (e.g. to add or remove classes, to wrap existing code, etc.). When you do so, you should run cmake again (or let your IDE to run it) to regenerate a project for your development environment. One simple way to do this without having to open a command window is to slightly alter the CMakeLists.txt file located in the SEMyElement (e.g. add and remove a whitespace somewhere) and save it: when building the project (see the next section), CMake will detect the changes and update the project. Once your project is opened, you can now browse your SAMSON Element files and edit your code. The project contains one target for your SAMSON Element (SEMyElement), as well as some cmake-specific targets. When you generate new SAMSON Elements with the SAMSON Element generator in the same folder, CMake will re-generate the project files and will add new targets as needed. You may now check that your code compiles by either building the target corresponding to it (SEMyElement) or when your solution contains several SAMSON Elements and you want to compile them all at once, by building the ALL_BUILD target. To be able to use yourSAMSON Element, it should be installed in a specific SAMSON directory to make it available in your SAMSON installation. 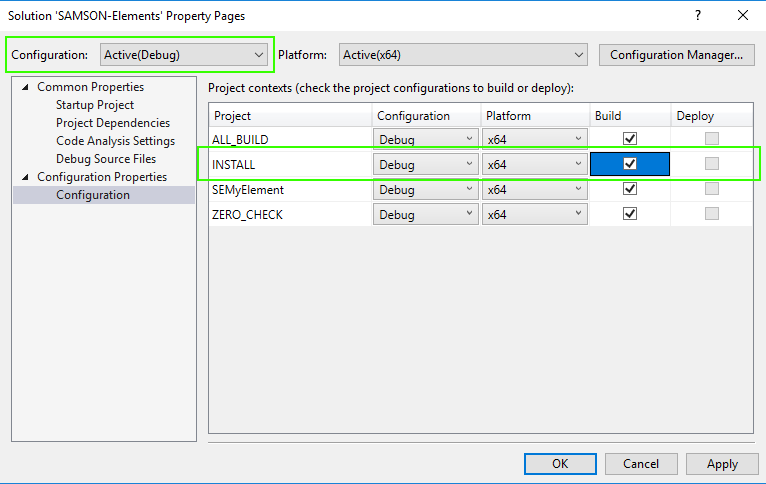 For that, open Properties of the solution ( right click on the Solution "SAMSON-Elements" and choose Properties in the context menu); for both Debug and Release configurations, in Configuration Properties > Configuration tick the build checkbox corresponding to the INSTALL target. Building the INSTALL target will automatically compile the code if necessary. 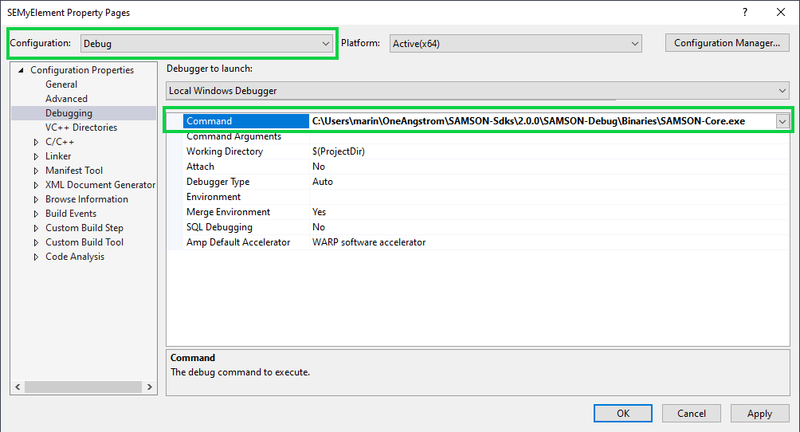 Now you can build the INSTALL target (either in Release or Debug configurations) to install your new SAMSON Element (building the INSTALL target will automatically build your project). If the build was successful your SAMSON Element should be available when you launch SAMSON (for Release configuration - SAMSON-Core from SAMSON installation, for Debug configuration - SAMSON-Core from the SAMSON SDK installation). During startup, your SAMSON Element will be loaded alongside with the SAMSON Element you added from SAMSON Connect, as well as other SAMSON Elements you developed. Note that a SAMSON Element compiled in the Release mode will be available only when launching the SAMSON-Core executable provided with SAMSON installation, while a SAMSON Element compiled in the Debug mode will be available only when launching the SAMSON-Core executable provided with SAMSON SDK installation. SAMSON users only get the Release configuration, since this is the optimized one. The SAMSON SDK installer, though, adds a Debug version of the SAMSON-Core executable. It is this version that should be started when testing or debugging SAMSON Elements compiled in the Debug configuration. Now you can build the solution (menu Build > Build solution or F7 or Ctrl + Shift + B) which will build all the projects including INSTALL, and then run the StartUp project ( F5).